Survey Design: How to Design a Survey that people will love to Answer? Survey Design is the process of creating surveys with the goal of receiving maximum insights from survey research. It includes making use of an Online Survey Tool to design a survey from scratch or using ready-made Survey Templates. Most important part of the survey process is to create questions that accurately measures opinions and behavior of respondents. Response rates will be wasted if the information gathered is based on biased questions. 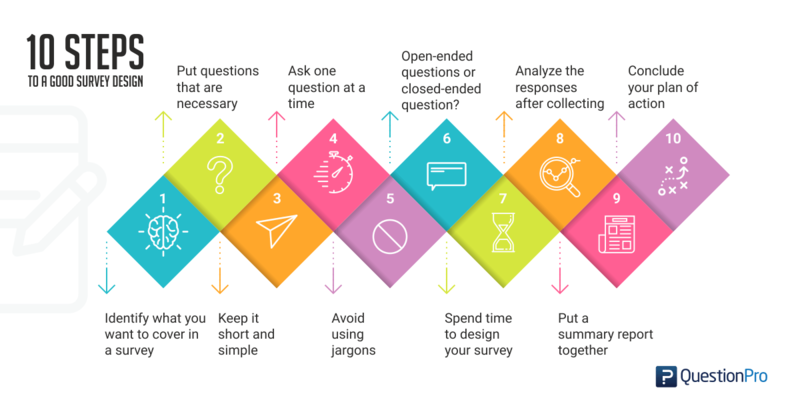 Gathering good feedback involves both, writing good questions and using a good survey design to organize those questions. Even before you finalize the survey design, it is important to think about what is the objective of deploying a survey. Identify what you want to cover in a survey and make sure the topic is clear at once. Once, there is clarity obtained on what the survey is going to be about, other steps will follow. This is best done by splitting your core objective into multiple unique points. The brief should answer some basic questions: What kind of demographic details do you want to capture? Do you want to calculate Net Promoter Score? Will it be a micro or macro survey? How many questions do you want to have? What type of questions should be open ended? Do you want to add variables to personalize surveys for respondents? Introduction: sets the respondent’s expectations – may also be covered in the survey invite. Screeners: questions designed to ensure the respondent meets your criteria. Body: the bulk of the survey. Questions on usage, attitudes, awareness, concept testing, competitive perceptions, etc. Demographics: questions used for profiling or segmenting the respondents. No need to repeat any demographics used as screeners. Final Thoughts: close with an open-ended question asking for any additional thoughts. Redirects: could be a simple thank you page, a redirect to your website, or back to a panel provider. Now that you have your core objectives brief ready, it is time for you to convert these core points to real survey questions. It is rather easy to start deviating from the core objectives and boundaries once it start creating the survey on QuestionPro, given the amount of freedom and choices that the platform provides. However, it is important to stick to what you had already decided, unless you are absolutely certain that the objectives need some alterations to make your survey better. Respondents may get irritated and less likely to complete the survey if a topic is not clear and tend to bounce back and forth. Therefore, it is good to make sure that a logical order is followed n placing the questions and to stick to a certain topic. Also, if the survey is too lengthy respondents might not stay interested in filling out entire survey and survey results might get compromised. Hence, keep it short and simple. Branching questions or asking more than one question at a time can confuse respondents and they might not be able to choose correct option/options from the list of answer options provided to them. Therefore, it is advisable to ask one question at a time, to give clarity to respondents. QuestionPro features over 20 advanced logic that are best used for effectively making a complicated survey more systematic and in most cases it also helps in making them shorter. Another advantage of using logic in your surveys is in making them more user friendly by simplifying the answers. For respondents to respond to survey, avoid using jargons and too many technical terms. Using a language that is easily understood by respondents will help them understand and respond to surveys in a better manner. Language is extremely important while designing a survey. The idea must be to make it as simple as possible for the respondent to answer your survey. The more complicated it becomes, the more likely it is that respondents will leave their surveys incomplete. This is always the tricky part, whether to ask open-ended questions or closed-ended questions.The trick here is, balance out both these options. Try and include descriptive and objective questions to balance survey. Again question types should be carefully sorted as it defines the tone and importance of asking a question in the first place. We are in the business of asking questions – a bit like a business therapist, if you will. Not only do we craft survey questions to ask respondents, but we also need to be forthright in the questions we ask our clients. When preparing for an initial client meeting, make sure you prepare questions regarding the nature of the problem, including their “gut feelings”, as well as asking for any relevant information about their business operation in which you might not already know. Market research, or research in general, does not thrive if it is kept in a vacuum. Therefore researchers need to be proactive in communications with internal and external clients. Management is likely only to see the “result” of a problem, such as a decline in sales or a downtrend in customer satisfaction ratings. The cause of these problems, e.g. a shift in market preferences, can only be identified when we look below the surface. It is researchers job to query clients in order to understand what is known (a decline in sales) and to identify possible causes of the problem that we quantify via our research efforts. A survey needs to create a brand awareness with respondents. For this, survey creator can use the brand language (brand logo and brand color) so respondents can correlate with it. QuestionPro lets you fully own your surveys through self-branding with logos. You can also personalize your surveys for your respondents using customer variables. This is useful for capturing responses in earlier questions from your target audience and use them to create automated form fills that personalize the later questions. For example, capturing the respondent’s key demographics in the beginning for the survey allows you to set questions that use this data and personalizes the survey. Once you’ve sent out the survey, collect all the responses and maintain a document or excel sheet for the collected responses. This excel sheet should have all the mentioned classifications of the survey so that you have all the data in place. You need to make sure you follow this step and categorize data into Behaviour, Psychographics and Demographics. For any researcher, it’s extremely important to have organized data so that analyzing, predicting outcome and writing reports become easy. After collecting responses and analyzing it, share your analysis with your customers using a summary report. You should have all the data gathered from surveys in a particular format by this stage. The readers should get a clear picture of your goal, i.e. what were you trying to attain from the survey?Make sure you cover questions such as do users prefer/use a particular product or service? Which product do the users prefer? Any comment? Prepare your final action plan on the basis of your goal, responses put together and drawn a conclusion. Mend your final plan and start executing the changes. A survey creator may direct a pre-testing of the survey to a focus group during the development process to get a better understanding of how respondent in that group may respond. Pre-testing is a good practice as a survey creator can comprehend in the initial stages if there are any changes required in survey. Clients may want 40 minutes of a respondent’s time, but respondents are not always willing to go that long. First of online survey design best practices is to break longer surveys into shorter projects. If you know your intended audience and if you know the overarching research questions that need to be answered to drive decisions then you can create an effective survey. An effective survey balances the informational needs of the client while respecting the respondent’s time and willingness to share their opinions. Add page breaks after each section of the survey. Customizable survey Headers and Footers. Add HTML and logos into the header and footer of the survey. Use HTML to customize the surveys. Customizable buttons for submit and continue. Display 'Back' button on the survey allowing respondents to go back to the previous page to edite/review response. Allow respondents to exit the survey without answering or midway. Display progress bar on the survey to let respondents know the percentage of survey loaded. Complete branding of your survey. Insert JPG and GIF files, including your company's logo. Use images in questions and / or answer options. Ability to use / play audio files on surveys. Ability to play videos on the survey. Offers rewards to increase survey response and completion rates. Use multimedia on survey, including flash, avi, mp3, quicktime etc. Full support for all languages including left-to-right languages. One way to increase response rates to your surveys is to enable your surveys with Viral Marketing or as we call it Recursive Invitations. The Recursive Invitation process allows end-users (respondents) to invite other users to take the surveys. The Spotlight Report allows your respondents to visually see how their responses compared to the overall survey responses immediately. The Review/Print option allows respondents to Review/Print their survey response after taking the survey. Customize the look and feel of the survey using CSS. Lists vs. Dropdowns– questions involving categories (both single or multiple select) can be presented either as a visible list or via drop down menu. If your survey page is getting crowded then consider dropdowns. The key is to be consistent in your use and not mix formatting types on the same page. Branded vs. Blind – surveys are communications just like websites or emails and should make use of your accepted brand standards. Competitive intelligence research is the exception. In this use case, avoid colors and logos that could potentially sway respondents in favor of your brand. Number of Questions per Page – It comes down to scrolling vs. clicking. Keep the number of questions per page to a reasonable number (1 – 4). Some survey designers prefer the single question per page, but with drop downs you can move beyond that. However, always keep an eye out for visual clutter. Fonts– select fonts that are clearly visible across multiple devices. Typically sans serif fonts such as Arial or Helvetica work best. Use of pages that provide a mental break – for example a text slide that thanks the respondent for their participation so far and lets them know what to expect as they progress toward completion. This could also be in a visual format. Text – leverage section headings when shifting between survey blocks. This provides a visual cue that the nature of the questions is changing. Descriptive text is called for when the process requires the respondent to have a deep focus, such as considering product scenarios. Keep these as brief as possible. Avoid loaded or leading words or questions Slight wording changes can produce great differences in results. Could, Should, Might all sound almost the same, but may produce a 20% difference in agreement to a question (The supreme court could.. should.. might.. have forced the breakup of Microsoft Corporation). Strong words that represent control or action, such as prohibit produces similar results (Do you believe that congress should prohibit insurance companies from raising rates?) Sometimes wording is just biased: You wouldn't want to go to Rudolpho's Restaurant for the company's annual party would you? Misplaced questions Questions placed out of order or out of context should be avoided. In general, a funnel approach is advised. Broad and general questions at the beginning of the questionnaire as a warm-up. Then more specific questions, followed by more general easy to answer questions like demographics. Mutually non-exclusive response categories Multiple choice response categories should be mutually exclusive so that clear choices can be made. Non-exclusive answers frustrate the respondent and make interpretation difficult at best. Nonspecific questions Do you like orange juice? This is very unclear...do I like what? Taste, texture, nutritional content, Vitamin C, the current price, concentrate, fresh squeezed? Be specific in what you want to know about. Do you watch TV regularly? (what is regularly?). Confusing or unfamiliar words Asking about caloric content, bits, bytes, mbs, and other industry specific jargon and acronyms are confusing. Make sure your audience understands your language level, terminology and above all, what you are asking. Non-directed questions give respondents excessive latitude What suggestions do you have for improving tomato juice? The question is about taste, but the respondent may offer suggestions about texture, the type of can or bottle, mixing juices, or something related to use as a mixer or in recipes. Forcing answers Respondents may not want, or may not be able to provide the information requested. Privacy is an important issue to most people. Questions about income, occupation, finances, family life, personal hygiene and beliefs (personal, political, religious) can be too intrusive and rejected by the respondent. Non-exhaustive listings Do you have all of the options covered? If you are unsure, conduct a pretest using the "Other (please specify) __________" option. Then revise the question making sure that you cover at least 90% of the respondent answers. Unbalanced listings Unbalanced scales may be appropriate for some situations and biased in others. When measuring alcohol consumption patterns, One study used a quantity scale that made the heavy drinker appear in the middle of the scale with the polar ends reflecting no consumption and an impossible amount to consume. However, we expect all hospitals to offer good care and may use a scale of excellent, very good, good, fair. We do not expect poor care. Double barreled questions What is the fastest and most convenient Internet service for you? The fastest is certainly not the most economical. Two questions should be asked. Dichotomous questions Make sure answers are independent. For example the question "Do you think basketball players as being independent agents or as employees of their team?" Some believe that yes, they are both. Long questions Multiple choice questions are the longest and most complex. Free text answers are the shortest and easiest to answer. When you Increase the length of questions and surveys, you decrease the chance of receiving a completed response. Questions on future intentions. Yogi Berra once said that making predictions is difficult, especially when they are about the future. Predictions are rarely accurate more than a few weeks or in some case months ahead.